CRUISING: The industry operates mobile assets that can be moved from uncompetitive markets to more favorable ones. Senate tax bill would impose a new tax on the cruise industry. AAPA wants tax bill to retain the ability of state and local governments to do “advance refunding” of their bonds. The Maritime Exchange for the Delaware River and Bay wants the wind energy tax credit to stay as is. The American Association of Port Authorities (AAPA) has written Senate leaders to oppose new taxes on the cruise industry included in the Senate tax reform bill. Ports are also concerned about provisions that would restrict the refinancing of municipal bonds and the reduction of the tax credit for wind energy, both in the House bill. “The cruise line industry is a significant maritime industry responsible for driving economic growth and creating jobs at US port facilities, making it an important part of the American economy,” wrote Kurt Nagle, AAPA president and CEO. Nagle noted that the cruise industry operates mobile assets that can easily be moved from uncompetitive markets to more favorable ones. The cruise industry contributed $50 billion to the US economy in 2016, supporting 370,000 jobs that paid $20 billion in wages and benefits. Cruising is a growth industry, with demand increasing 62 percent in the past 10 years. In 2016, 11.52 million of the 24.2 million global cruise passengers globally were from the US. The AAPA also wants the tax bill to retain the ability of state and local governments to do an “advance” refinancing or “refunding” of their bonds. A state or local issuer can refinance – or “refund” – a tax-exempt municipal bond by issuing a new “refunding” bond, using the proceeds to pay off the original bond. According to an AAPA document, advance refundings have saved state and local governments more than $11 billion in the last five years but the current tax bill making its way through Congress would prohibit bond issuers to do an advance refunding. A refunding bond issued within 90 days of the refunded bond’s redemption is a “current” refunding, while a refunding bond issued more than 90 days before redemption is an “advance” refunding. But, says the AAPA, market conditions favorable to refunding can occur outside the 90-day window of a current refunding and waiting to do a current refunding may miss savings particularly when interest rates are rising. The organization is urging members of Congress to strike the prohibition of tax-exempt advance refundings of municipal bonds in the house bill. Meanwhile, the Maritime Exchange for the Delaware River and Bay is worried about the provision in the House tax reform bill which would lower the wind energy production tax credit to its 1992 level of $15 per megawatt hour. The credit currently stands at $24 per megawatt hour. The Senate tax bill is silent on the issue. The Maritime Exchange wants Congress for to implement a permanent extension of the wind energy tax credit, currently set to expire in 2019. 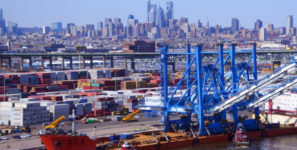 “US ports are key partners and significant links in the transportation supply chain tapestry dealing with wind energy components that are imported or installed offshore,” said a letter the organization wrote to Pennsylvania congressman Bob Brady, a Democrat. Over the past few years, the Port of Wilmington, Delaware, has received 600 wind blades destined for Pennsylvania, according to the document. The Exchange urged Brady to work towards eliminating language in the House bill that lowers the wind energy tax credit PTC in a final tax bill and replacing it with a permanent extension of the current credit.